The Deluxe Matilda doll comes in a specially designed box containing the 16” tall articulated vinyl doll wearing a grey velvet dress with a plum taffeta kirtle. She also wears stockings and grey court shoes, historically inspired underwear and a beautiful headdress with pearl bead trim. A lovely silver key necklace completes this unique dolls outfit. Also available is the novel, Matilda's Secret. This tells of the thrilling adventures of thirteen year old Matilda in the court of Henry VIII with her cousin Katherine Howard. Breathtakingly written by Sandra Goldbacher, this 180 page book also contains some beautiful illustrations. 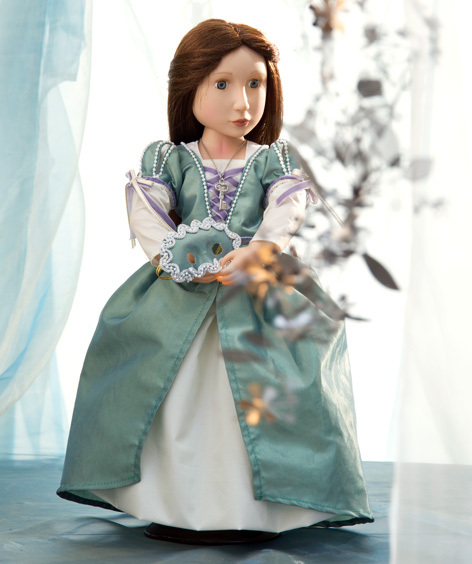 As the first in a planned series of historically inspired dolls, Matilda is perfect for girls aged 8 and over. Please tell us what you think of Matilda Your Tudor Girl Doll by A Girl For All Time. It's great having the same name as the Matilda doll - she's so beautiful, any girl aged eight or over will love her. She puts the wow back into history. Matilda is stunning and the attention to detail is second to none. The fact that there is a book written about the adventures of Matilda bring it to life. Matilda is the most beautiful doll I have ever seen. I feel in love with her as soon as I saw her and my little girl thinks she is so special. We love that fact she has a story with her. My husband is a teacher of 8 year olds and history is a hard subject to get the girls to like. But he is going to take Matilda to school and get the girls learning about her life with Katherine. Will be recommending to all! This young lady is elegant, demure, aristocratic and captures the romance of the age from which she is inspired. Any girl would be enchanted to receive this beautiful doll. This is a really beautiful doll with lots of attention to detail. I love the fact that she is a 16" doll as they look great on display and stand out against any "fashion" dolls in a little girls collection. The thing I like best about this doll in particular is the Tudor theme because it really will get a child thinking about history and spark off her imagination. What an amazing doll Matilda is! My 9 year old daughter loves playing with her and is also really enjoying the book that tells the story all about Matilda's life in the Court of King Henry. She has already learnt so much history. I have bought her the keepsake book for Christmas and I know she is going to LOVE it! All of the products are made to a really high standard something you don't always get nowadays, so I'm happy too. Would MOST DEFINITELY recommend! I bought the Matilda doll for my 11 year old daughter and she is absolutely thrilled with it. It is the most beautiful doll and all the accessories are gorgeous. She loves the book which really brings the doll to life. I would thoroughly recommend this doll.